Most customers still rely on ABAP and Web Dynpro based “classic transactions/applications”. This application gets further complicated in functionality with each release and each custom enhancement. The focus so far has been to meet business requirements and not on usability and user experience. With the introduction of new UX solutions, SAP has plugged this gap and provided tools to the clients to make their user’s experience better. 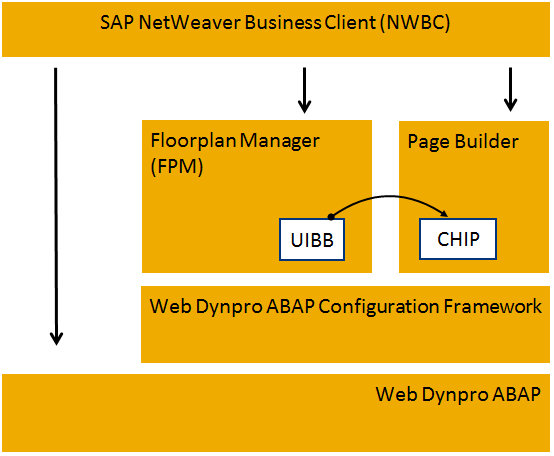 In 2006, SAP introduced the Floor Plan Manager (FPM) for ABAP Web Dynpro enabling development through a model driven approach, which is still quite relevant for adapting SAP web applications. FPM helps in combining application-specific views of one or more business applications to create a new application. These can be done fairly quickly by taking advantage of templates such as floor plans and generic UI building blocks. FPM also supports in creating and configuring the application specific view using UIBB (User Interface Building Blocks). Some UIBBs are: Form Component, List Component, Tabbed Component, Search Component and Hierarchical list component. In 2011, SAP introduced the SAP UI5 – the development toolkit for HTML5, on which SAP Fiori applications which UI5 based applications can be developed using a model driven approach. As per SAP’s UX strategy, the Fiori Launchpad, which can run on any device, is seen as the single point of access for business applications. SAP Screen personas, introduced in 2012, can be used to personalize existing ABAP screens by drag and drop approach to make them more usable and visually appealing. These UX solutions help to remodel the user Interfaces, make the screens intuitive and thus enhance the user experience. All these can be done in a short period by using drag & drop features and by using several predefined contents like Work lists, Landing pages and Side panels, which are already available. It must be understood that successful UX enhancement depends on the specific UX strategy, which has to be defined based on requirements of users and the solution landscape. SAP Fiori is a series of app suites, being introduced in waves (When wave 1 was release they came up with 25 apps, From wave 8, the product portfolio has more than 500 apps). The apps in these waves are written by SAP app developers. But Fiori is a design approach, which has a number of soft constraints. And when an app is built to conform to those constraints, it exhibits Fiori-like features: simple and recognisable design, easy to use, a role-based approach, and following one of a core set of UI patterns. 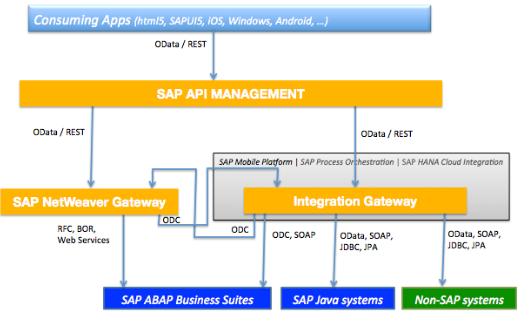 Any form of implementation or development requires SAP Gateway (the integration technology that connects the frontend SAP Fiori app to the backend SAP system). In addition, knowledge of SAPUI5 (the programming language on which the UI of SAP Fiori apps is based) is needed in order to customize or create apps. Also Fiori is the main UI for most transactions and business processes on S4 Hana. Fiori Apps are developed using SAP’s HTML5 framework called SAPUI5, which is also often called UI Development Toolkit for HTML5. Fiori 2.0 is the latest release on New UX Designs which was just announced in Sept 2015 about UI/UX changes, but not yet officially available as on date. Meanwhile Fiori 1.0 is most widely used. 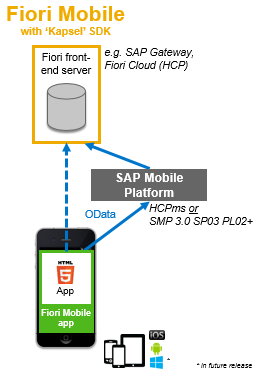 SAP Fiori is based on apps in different areas of application and technical requirements. Transactional apps – as the name implies this represents transactions to be completed, such as vacation applications to be entered and approved. 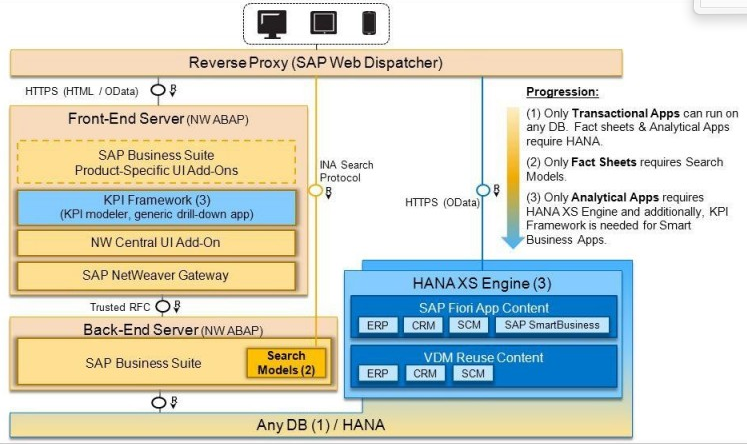 For performance reasons it is recommended to use SAP HANA in conjunction with these transactional apps, but it is nonetheless not a requirement and it runs on other database systems too. Analytical apps – these provide real time information, so to speak, provided by the SAP Business Suite. With this information you can Key Performance Indicators, live. These applications are performance intensive and run only on SAP HANA. Fact Sheets – This is to display information. One can navigate from one fact sheet to the next. This information is based on the requirements of various business operations. Like analytical apps, fact sheets run only on SAP HANA. Implementation Guides for Fiori, Look for on sap support. 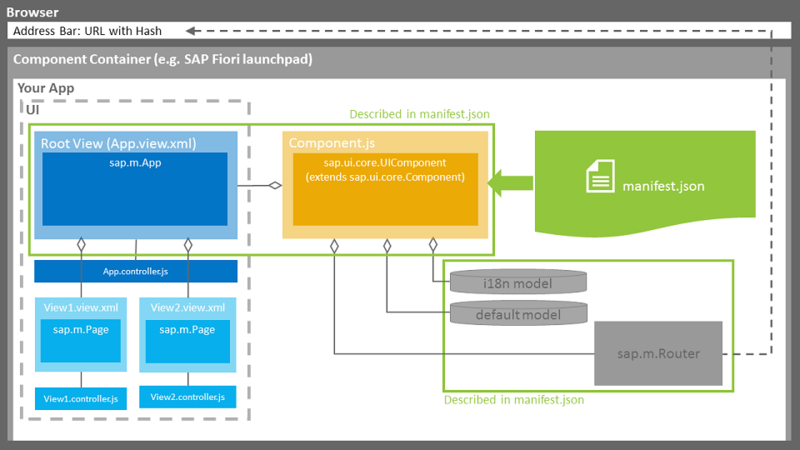 SAP Fiori applications can be extended by enhancing one or multiple content layers, depending on the extension requirements and the application type. Various levels of proficiency is required to extend (development rework) features of Standard Fiori Apps, depending upon the content layer mentioned above. When you invoke an app, the application itself is downloaded to the browser, along with the SAPUI5 runtime. This is a paradigm shift from Webdynpro UI/FPM, BSP UI, SAPGUI. To program “SAP Fiori-like” applications it is necessary to develop in UI5 and to keep to specific provided design patterns. Devepment Guidelines are provided according to which the webapps should be developed. Below courses will give you good heads up for your SAPUI5 development journey. Test SAPUI5 waters with- https://sapui5.hana.ondemand.com/explored.html, (These contain frequently used list of controls you often see in your Fiori Apps). High level Application Technical Architecture of Fiori-compliant SAPUI5 App. SAPUI5 can exchange data using XML HTTP Request object to call complete datasets from the backend systems. But SAPUI5 controls are optimized to exchange data using the open data OData protocol, also known as ‘The SQL of the Web’. SAP has chosen OData as the de facto standard for all SAP solutions. SAP Hana XS Engine will support OData out of the box. SAP NetWeaver Gateway will used as the OData bridge between SAP Business Suite applications and SAPUI5 applications like SAP Fiori. So if you want to develop SAPUI5 applications, you definitely must know the OData specifications. So you need to have understanding of XML, JSON for Rest-based webservices like ODATA. You may have also heard about OpenUI5, there is often misconceived notion that SAPUI5 was derived from OpenUI5. OpenUI5 is SAPUI5’s sibling. While the use of SAPUI5 is subject to an SAP licence, OpenUI5 is Open Source. All the functionalities built using SAPUI5 are suitable for productive use, and SAP support, which is not the case with OpenUI5, which is backed by open source community ecosystem. The difference between OpenUI5 and SAPUI5 is in some control libraries which have not (or not yet) been put under an Open Source license. But the essentials (sap.ui, sap.m) are there. If you’ve written a UI5 powered app, as long as it doesn’t use charting, for example, there’s a good chance that you can just switch the toolkits and it will still work. Of course, there’s more to the detail, but that gives you a rough idea. It is intended for Non-SAP customers. 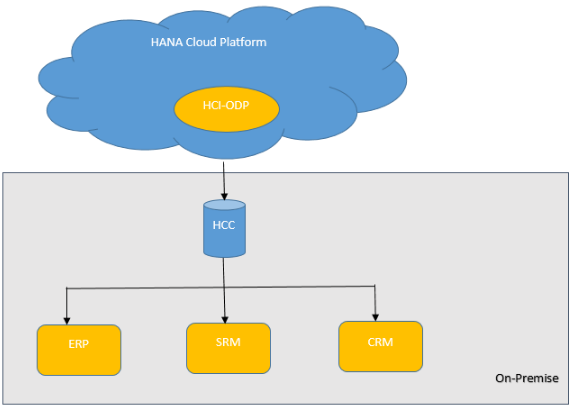 We use Hana Cloud Platform (HCP) Mobile Services (MS) or SAP Mobile Platform (SMP On-Premise) when a company needs some of these advanced features and access to mobile native features like bar code scanning, camera, push notifications, device storage, geo-location, offline sync,app update etc…. as said if you use HCPMS or SMP, you may build your own applications based on ui5 for iOS, Android, Windows Phone.. to achieve these features. 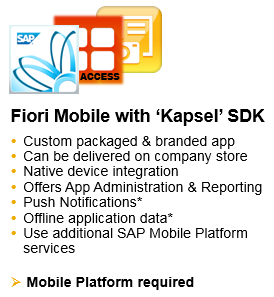 If you are looking for such Fiori apps with advanced features, SMP provides libraries such as Kapsel SDK to build your apps much easier. Mobile Native Apps can be built using SAPUI5 based Kapsel SDK and Android SDK utilizing Apache Cordova framework & SAP Hybrid Application Toolkit (with SAP WebIDE), in conjunction with HCPMS, can be used as installable app. Such Hybrid Native Apps, contain all UI, Web-Assets in the App container, which provides for improved performance, and use of native device functionality. That said, there is a LOT you can do with online apps using Fiori and SAPUI5 alone. So unless you have an urgent use case for native or offline features in your apps, you might want to start with simple online apps first, and leave the advanced features until some future time. You can always add SMP or HCPms later. The SAP Gateway plays important role in exposing SAP ABAP-based Business Suites for consumption by numerous UI-channels, SAP and non-SAP. Including mobile apps, Fiori / UI5 / Hybrid / or Non-SAP UI frameworks. So what about use cases involving integrating Non-SAP BackEnd Data, as Web Service inorder to consume it as SAPUI5 or Fiori App. With increasing demand for IoT specific integrations. 3rd Party Integration becomes very crucial to next generation technology roadmap. Integration Gateway is a technology component that provides design-time tools and the associated run-time for modeling, composing and provisioning OData services based on one or more APIs from various SAP and non-SAP data sources. Among the data sources supported today are, SOAP (Simple Object Access Protocol), JPA (Java Persistence API) and JDBC (Java Database Connectivity) to access non-SAP data sources as well as OData Channel (ODC) for accessing OData services provisioned via SAP NetWeaver Gateway. OData provisioning in HCI allows you to create OData from SOAP service. So you could consume it in applications such as Fiori and Mobile. With this you can mash up 3 data sources: SOAP, REST and OData. The Limitation with this approach is that, only V2 complaint ODATA services can be integrated. CRUD or Batch process will have restrictions. The performance may not be the same, as compared to when using the external service directly, as this is more or less forward proxy mechanism. pretty comprehensive and cool blog. Thumbs up. 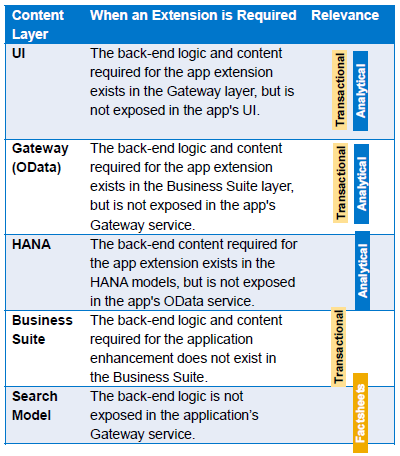 One remark: Do you know the SAP Enterprise Architecture Explorer? It provides a lot of additional information that you could incorporate in your blog. Hi @Juergen Jakowski, Thanks have added those links.